It’s one thing to make a promise, but quite another to keep it, and Daniel is only 12 years old. How can he keep his word when the family’s situation is going from bad to worse and his best friend seems to only want to drag him deeper into trouble? Although it is set in the Great Depression, All of Us Together has a sense of timelessness that separates it from more traditional historical fiction books. It is an emotive, character-driven tale that is more interested in Daniel’s responses to his troubles than to the troubles themselves. Above all, it is a story that will feel completely relevant to Condon’s 8 – 12 year old readership, whether or not they have ever experienced poverty or the absence of a parent. 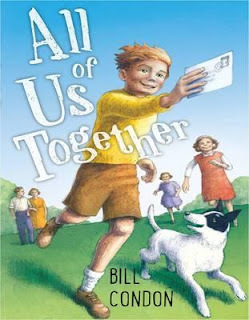 All of Us Together is a story about growing up, washing off the naïveté of childhood and seeing the world as it really is. It is a story about learning to make the right choices, instead of the easy ones. A great choice for primary aged children, who may, like me, be hoping for a sequel.